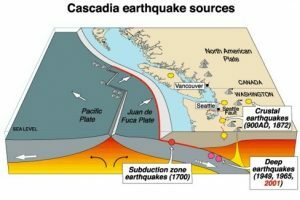 The Cascadia Subduction Zone is a 1,000 kilometer fault that runs from Northern Vancouver Island to Northern California. The fault itself is a boundary between two tectonic plates: the Juan de Fuca tectonic plate is moving towards and getting forced under the North American plate that we live on. A section of that boundary has become locked together – the plates are no longer sliding smoothly. So, all that forward movement is being stored up inside the rocks, waiting for the day that the energy will be released as a catastrophic megathrust earthquake, colloquially known on the Pacific Northwest as the ‘Big One’. The tremors caused by slow slips are different from routine earthquakes that occur in the Pacific Northwest, and they aren’t felt on the surface because they originate so far underground. During the slow slip, in late December 2015, around 8,000 mini-tremors were recorded. During this slow slip B.C.’s South Coast was hit by an earthquake that shook many people from their sleep just before midnight, in what one seismologist called the largest quake in the region in years. This 4.8M earthquake was recorded on December 29th, 2015 at 11:39pm in Victoria B.C. There couldn’t be a better time to go through your emergency plan and purchase supplies. Find a local GetMyKit.ca Emergency Kit retailer, or visit our shop. We offer free Emergency Preparedness Workshops and are looking for venues across British Columbia. Check our Facebook page for events near you, or contact our office 1-888-673-1222.